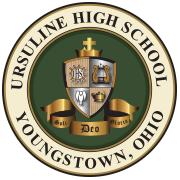 The Cushwa Library and Learning Center, located on the second floor, provides the students of Ursuline High School with a first rate research and study space. The Faculty of Ursuline strive to instill an appreciation for using library resources and services effectively as an essential part of active learning. Students are equipped with the tools to be responsible learners in the 21st Century. The Library and Learning Center is open before, during, and after school for student use. Each day from 2:30-4pm a certified math teacher staffs the Library and Learning Center to provide free math tutoring to any Ursuline student. All UHS students are invited to use the Library and Learning Center after school to complete work. In addition to traditional print materials, the Library and Learning Center is home to the “Digital Research Lab” which contains 30 desktop computers and printers for student and classroom use. Students also benefit from collaboration spaces and online research tools in the Library and Learning Center.